As mentioned in my previous post, below are five thoughts for what could take place in 2018, categorized by degree of likelihood: most likely –> least likely. The euphoria around cryptocurrencies and ICOs continues due almost entirely because of retail sentiment, not just because of institutional action. Every valuation model that has been proposed to gauge what the price of a certain coin will be, fails almost entirely because of the inability to model sentiment. Contra Chris Burniske (note: he did not really disclose that he owned bitcoins while covering cryptocurrencies as an analyst), there are no ‘fundamentals’ to nearly any coin, in fact, many of the “top” coins don’t even do what they claim to do. Want proof? Look at the most talked about ICOs and altcoins and airdrops that were created in 2013-2014. How many of them have actually delivered what they marketed? Basically none. Yet, if they are still listed on an exchange, odds are they are trading at near all-time highs because retail investors really don’t care about functionality or utility: they want narratives that paint pictures of Moonlambos in their near future. When you have free-entry and no gatekeepers when it comes to creating money supply, people will just create a new coin as it always has more financial upside. Rather than go through the laundry list of all the areas for regulatory and law enforcement action, check out (attorney) Christine Duhaime’s explanation. With that said, while a case could be made that entities like Bitcoin Core – and its vocal surrogates – behave a lot like administrators, there are few indications that the any development team will be sued right now. Pretty much the most popular twitter personalities nowadays are the shills and pumpers who benefits from one anothers antics. It’s a non-stop contest to see who can say the most outrageous things about what cryptocurrencies will do to the world. The winner gets to cash out on a secondary market and buy a Swiss resort. The loser who said Junkcoin would only jump 10x instead of 100x also gets to cash out and retire in the Hamptons. How many of the most egregious examples of investors and advisors that promoted these will be held accountable? Probably very few even though the SEC put out a press release specifically around the promotion of ICOs… we still regularly see ads for ICOs on social media (e.g., “general solicitation”). For those hoping that techbros and their apologists will be held accountable, this is probably not that year. This includes lobbying groups involved in disinformation campaigns for their own ideological purposes. If we were to aggregate the amount of revenue generated by enterprise-focused DLT vendors, based on the known RFPs that were won last year and are currently being bid on, I’d guesstimate that about $100 – $200 million is at play this year. This is based on the fact that most RFPs seem to be for less than $10 million. It’ll take at least 6-12 months to build an MVP and then even longer to get approval for additional phases. As mentioned in my previous post: unfortunately our sample size of big infrastructure builds on the enterprise side is still limited. Examples include the the DA / ASX deal (which took 2 years for a final decision to be made). Another large one is the DTC trade, the vendor of which is IBM. If built and put into production, these will eventually recoup costs but the bigger revenue will likely come from actual enterprise-licenses: seats to use the network. This year’s revenue is one thing. There is also recurring revenue (run vs build). There is also the fact that last year some/many deals were “bought” for marketing and credential building purposes (so they are subsidized). But I think this year suppliers are less willing to buy the business and bid low on price. We (the industry) could be in steady state production by year end for some implementations. I think $100-200m is broadly right for revenue to play for this year. His estimate included Q/A support and SLAs. I also would predict that, just like last year, there will be very few new enterprise-focused vendors entering the market from the early stage startup world. And that enterprise vendors struggle as a whole to attract and retain junior developers because they have to compete with cryptocurrency-related projects that may provide higher compensation during this bull market. I think this is the least likely theme to occur this – and we should thank the gods – is using a cryptocurrency (anarchic) chain as FMI. Despite the mud that coin lobbyists and evangelists throw at enterprise-focused DLT vendors, cryptocurrency networks are systemic risks to the financial world and should be avoided at this time. It is one thing to have a coin bubble driven by unsophisticated retail investors. It is another to have a coin bubble because of leverage and integration with some real financial instruments. And it is another to have a coin bubble – and the mission critical systems of the world’s financial intermediaries – directly impacted by these coin fluctuations and not be able to hold any of the validating nodes accountable… because they are pseudonymous miners in a jurisdiction that doesn’t recognize the standing of a foreign lawsuit. If you are reading this, you are probably not terribly sympathetic to anyone who loses their shirt at this time for buying some random coin. On the other hand, you would be justified if you are worried that a national payment or securities depository is being run on top of Bitcoin via some kind of colored coin Rube Goldberg system. Reducing systemic risks to the financial world has been a top priority of financial regulators since 2008. 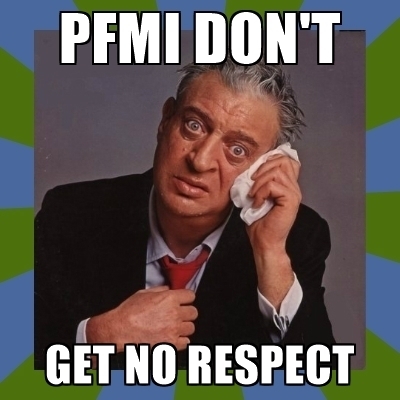 At the time of this writing, none of the existing cryptocurrencies being built seems to have gone through or respects a PFMI check-off. Or maybe that is a risk regulators and regulated financial institutions will be willing to take? As a friend recently said, with cryptocurrencies you always have to expect the unexpected. People are quick to forget the bear market of 2014-2015. Will the irrational exuberance die down once most of these cryptocurrency and ICO projects fail to deliver on their promises? Maybe not, but then again, check out the coin rankings over time on these four charts. I am actually kind of optimistic for new ideas being tested out in certain ecosystems, like Ethereum (note: this is not an endorsement of Ethereum or ETH/ETC). Now that proof-of-stake, via Casper, is being brought out of the lab and onto a testnet, we might be able to scratch off the environmental impact issue that is a blight on proof-of-work networks. CryptoKitties, via ERC721, is a neat demonstration of how to potentially create non-fungible property (assuming courts recognize it as such). I have been giving this some thought on other areas that this could be reused and commercialized. Note: there is an entire, virtual zoo of copy cats that has now arrived, including puppies and other animals. What do you think, will heads begin to roll as law enforcement learns what shenanigans are going on? Will an ETF-based on bitcoin futures be approved? It seems likely that the CME and CBOE will add futures trading for ether, what about other coins? Coinbase and several other former bitcoin-only exchanges have already announced that they will add more altcoins and everybody is guessing which one will be next. Will 2018 be a repeat of 2014 with altcoin mania again dominating mindshare? Share the post "Predictions for 2018"
This entry was posted in Bitcoin, Cryptocurrency, Current events, Distributed ledger, Ethereum, Infrastructure, Market research by Tim Swanson. Bookmark the permalink. Isn’t POS just MIGHT is RIGHT? In which case its not very different from the prevalent unregulated capitalism. Also as cryptocurrencies have become nothing more than speculative dollar proxies where everyone is hodling anyway, then POS further constrains (ad infinitum as systemic ‘miner’ replacements) the pretty much non-existent velocity of those currencies anyway as most of the currency is being staked or put into reserve in order to speed up transactions!. Sounds completely mad to me. Let me put that another way. In a recession central bankers think they can get people to spend money or increase monetary velocity using inflation, ZIRP or NIRP. 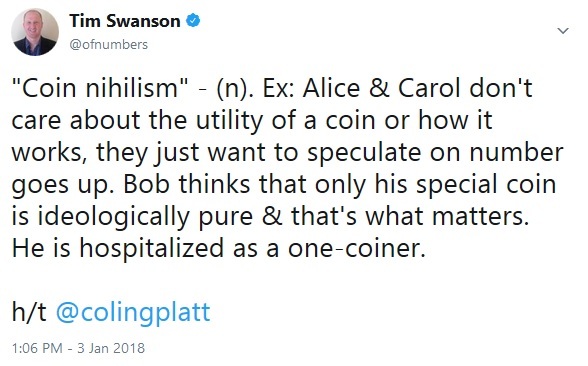 I’m struggling to find a metaphor for the crypto version in real life but it just seems weird that in the absence of interest rates, the only way to profit in this currency in addition to its speculative dollar exchange relationship is in staking/reserving or not spending it in general. Ethereum has matured a lot since it was first announced 4 years ago and has many implementations. Not saying it is perfect, definitely WIP. I have some friends that may be launching a new fork of it soon, pay close attention next month. It’s such a nice article. I would say it’s worth reading. Keep up the good work. I love how loyalty is looked down upon in this industry by all the greedy pigs mucking it up in the slop. Loyalty is a good thing and I respect the ideologists of blockchain technology but it can get really depressing. When people become blind fanatics and put in everything they have without considering the risks it might lead to personal tragedy. I would have to agree with Tim’s view on the persistence of cryptocurrency mania. Furthermore, as diffusion takes place and continued adaption of cryptocurrencies ensues, Fintech, investing, banking, etc. will be radically changed and/or disrupted. Currently, most – non tech-savvy – people struggle with simply understanding the complexities of cryptocurrencies. I came across a couple cheap books recently published at Amazon.com Kindle that may help the “average Joe/Jane” understand dozens of topics, quickly. Interesting thoughts regarding lawsuits. It can seem a bit like the wild west at the moment and I do wonder if some high profile cases could bring a bit more thought into the actions of those in the industry and with it stability. Very interesting predictions. I agree with this statement “Few if any of these personalities will be debunked let alone dragged to court” I am very curious to see if any of them actually get dragged to court not to mention lose their potential lawsuits. Bitcoin Bob on Is the Pitato why we can’t have nice things?